I do love a nice, simple supper dish and this was super easy to do. I’m one of those crazies who actually quite likes making puff pastry but, really, who has the time to make it from scratch?! Certainly not me on a week night when I’m picking up various children from various clubs, so I nearly always use shop bought. And it’s good stuff – much, much easier and creates a tasty meal with very little effort. 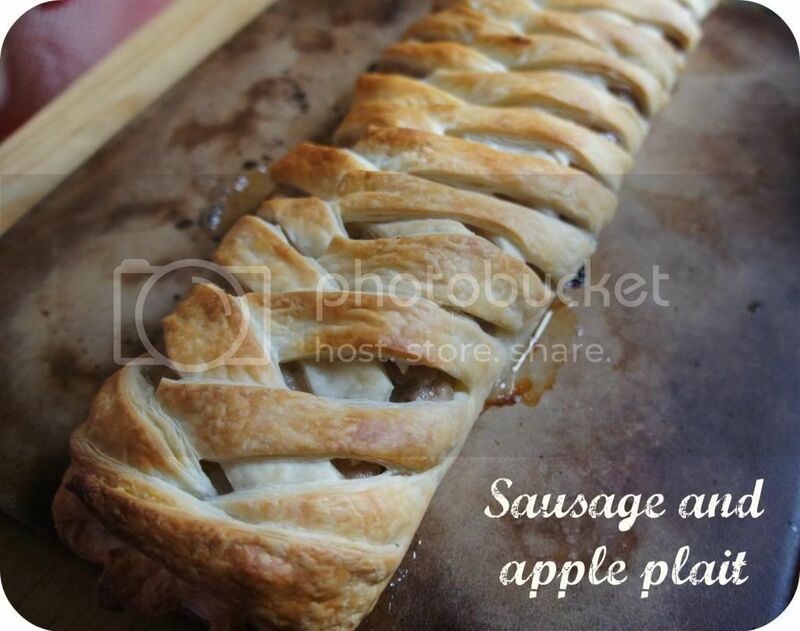 This week when I found I had apples, sausages and ready rolled puff pastry to use up, I just knew they’d go perfectly together. With a little nifty plaiting (or not!) this yummy dinner was on the table in no time at all! 1. Preheat your oven to 200°C. Unroll your pastry and place it on a non-stick baking tray. 2. Peel, core and slice the apple into thin slices then place them along the centre third of the pastry. 3. With a sharp knife, slit the sausage casings, remove the sausage meat and place it on top of the apples, squashing it down slightly so it joins together. 4. Make slits in the two sides of the uncovered pastry about 1.5cm wide and at a 45° angle. 5. Fold the pastry strips over the filling alternating which side you take them from (left then right then left then right etc.) a bit like doing a plait but with just two strands! You could experiment with different types of sausage and fillings – sundried tomato paste would work well as would turkey sausages with cranberry sauce, or buy some of the lovely flavoured pastries that are on sale now.